"I am very much satisfied with MSBI course online. It is very interactive and easy to understand. 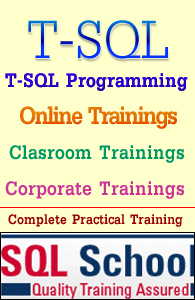 I can suggest anyone who wants to learn especially MSBI course from SQL School." "This online training is very helpful as the instructor (Sai) explains all the options on screen and how it can be used. 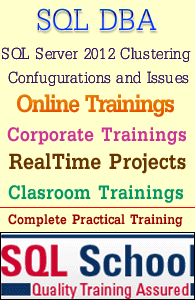 This online training helps both realtime working on SQL and also switching from one platform to another. "HI Sai, I learned a lot new things from these SQL training sessions. truly your information is very valuable. I will definitely recommend your training interested to learn MSBI. Best Institute. Thanks. " "I got job in phoenix(Arizona), my client is American express and working through IBM team. It is because of your good and quality coaching I cracked my job in 10 days. your material helped me a lot sir, my interview was conducted from Brazil all the knowledge from your coaching helped me a lot while I was answering there questions, I am very much thank full to you." "EXCELLENT TRAINER FOR MS SQL SERVER DATABASE ADMINISTRATION. HE IS ONE OF THE BEST FACULTY IN MS SQL SERVER TRAINING for DBA.HE IS REALLY ROCKING FOR DURING THE TIME OF SESSIONS. MOST OF THE TRAINERS DON'T HAVE THE REAL TIME KNOWLEDGE AND PEOPLE HAVING REAL TIME KNOWLEDGE THEY DON'T HAVE TEACHING SKILLS TO PROVIDE REALTIME TRAINING. BUT SAI IS HAVING VERY GOOD KNOWLEDGE IN BOTH TEACHING AND INDUSTRY REQUIREMENTS." "Sai! I am really delighted about the SQL Training course and i am surprised to see the depth of your knowledge in all aspects of the SQL server. I see that many database architects with over 15+ yrs experience doesn't have the knowledge that you have. I really enjoyed your sessions, definitely look forward to learn more from you in the future. Thanks again." Sai, "Every session is great and very valuable..its like aanimuthyalu! I want to say again n again we all are lucky to have you as the SQL coach. I learnt a lot from you Sai on DBA and BI side. Tnx. I salute you from bottom of my heart for being such an amazing mentor!!" "Dear Sai! This e-mail is to say BIG THANK YOU..for all teaching you done in our DBA / MSBI training sessions. I GOT JOB as SQL Server DBA after almost 6 months of struggle here in UK. I must Thank you for such a good and rocking lessons. to tell you frankly you made me to like/love/crazy about SQL Server though i have no idea about it before joining your classes." This is my first job in IT after my studies and i am a bit tensed how things will be after joining in the company. your suggestions are more helpful for me to get on well in the company as good DBA." "It was a lot of fun learning MSBI development. I really enjoyed it. I am doing a lot better than before on SQL Server and enjoyed to learn MSBI online." "I am V.Padma. I gained good knowledge about the subject. Previously I had theoretical knowledge about few concepts but did not know how to implement it but now I understood how to do things.I need to practice thoroughly. Your presentation was good. I am also thankful for extending your help even after the classes have been completed for DBA course and MSBI course online." "Listened his DEMO and got impressed two months back. I have seen him rocking into the depth of the subject like anything. Kudos to the quality training." "My Feedback on training undertaken: Good Trainer I have seen so far. Worth learning SQL Server by Sai. I can assure you for sure." "I learnt SQL Server from this SQL School and am there with them for about two and half months for entire DEV, DBA and ADMIN courses. Able to win the Job is Accenture as Support Analyst and many thanks to Sai Phanindra and his material. The advanced administration found to be very useful now in my current Role as Tier 2 Analyst though my background is .NET Development." "Joined for DBA course and continued for MSBI Tools training as well. Now, I am completely confident enough in my subject. I never thought SQL Server is SO BIG and huge!! !Loved learning it for about three months and quite chappy now." 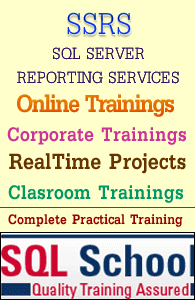 "I am very lucky for attending the SQL Server DB Administration Online Training from Sai. I can say this class is now a requirement for SQL SERVER DBA which was the reason for my attendance. The class had about 20 attendees from different background. There are no formal prerequisites for the course although I would highly recommend minimum knowledge of the topics would very helpful. This class is intended for those that wanted to become DBAs. This course is very helpful for certification and I would also recommend it for anyone considering the certification. The class was comprised of 2 sessions. In session 1 ran through T-SQL and DBA training, and in session 2 Adv DBA training. There were two things about this class that I found to be very different than any other classes I had attended. First, there was very good planning about training course. We never comprised about any topic related to DBA Responsibilities. We barely missed the class. The entire course was pasteurizing and drawing architectures of networks and storage and useful practice of T-SQL statements. For real time project experience the class was given an enterprise customer case study. The Case study had required knowledge of T-SQL and knowledge of DBA responsibilities. As we reached the end of each class, we would incorporate what we learned into those new and important topics thoroughly. The practice for class was actually designed very well. At the end of each class, everybody had to practice provided SQL Statements to get ready for the next day class. I noticed about the class that was very different from other SQL Server DBA Training classes. The instructor Sai knows what DBA needs to know to become a perfect SQL Server DBA. No money is wasted most importantly no time is wasted. Never had I seen such a display of SQL Server DBA course in such a class. This class was a very good summary of the DBA Course. It was a collaboration of all of the SQL Server knowledge and Experience of Sai had seen which is amazing. It was an outstanding display of all the things you have to remember when anybody wishes to be a SQL SERVER DBA. SQL SERVER DBA is like Ocean. I must say that our instructor Sai was constantly requesting questions and constantly encouraging us if we have any doubts for the course and promised to help us with the subject." "Training was very useful.The thing most impressive was the way the entire programme was structured. Gaps were provided every now and then to practice. I would not hesitate to do the MSBI sessions with Sai if need be.For anyone wanting an understanding of SQL DBA Training with real time scenario understanding I would most definitely recommend to join Sai's SQL School. I am looking for learning Business Intelligence next." "yes the training was very good and sai is very coperative. " "Good one. I will recommend your MSBI tools training Course to my friends. " Sai you just rock. And i am proud to be one of your students. The way you handle things and explanation of subject is unique. And I am looking forward to learn more subject from you. Thank you. I like following in your class: 1. PPT distributed one day in advance - this give us time to prepare for class; 2. Files from class help us to go through practical demonstration ; 3. You logging into gotomeeting before scheduled class time - this give us opportunity to clarify doubts; and 4. Course content wise - the level of concepts being taught are at adequate level, giving us strong fundamentals in T-SQL. I did not like: 1. Class timings - this is more to do with where I am. But even at past midnight you class is very interesting. I really liked all of my sessions. Every session was very informative and in each session there was so much to learn and practice. It is good to have such a instructor who is always willing to help and has so much command and knowledge of the subject. After completing the course got confidence on me that is because of ur superb training especially day-day plan was excellent.. will be in touch forever Sir.. Thank you very much.. Simply 1 word sir ur training was fabulous now its my time to work. Enjoyed learning MSBI from you Sai! Dear Sir, I feel very happy to get training from you and i have got more than i expected. I never forget the help you had given me to attending the advanced classes second time. Thank you very much for your valuable support all the time. I am very much satisfied with your course.It is very interactive and the way of your explanation is very good.Especially when we did not understand or having questions on any concept, at that time your explanation is very impressive by going to the Basics of that concept and explaining from the point that where we can understand easily. I can say, SQL School is the best Institute for MSBI Online Training. Thank you very much for the wonderful sql server training sessions that I had with you. I have learned a lot from this course .Thank you very much once again. Sai, I cannot thank you enough, what i learned from you is invaluable, you really go into the depth of DBA. I am so glad to have you as a teacher.you really push us to be better than who we are. Thank You Again for you time and effort. Thanks alot for nice session for both DBA and MS BI and its very much worth for what we paid. Everything is good about training. I liked it, learned many things and i think we covered many concepts and items in all the 3 areas - SSIS, SSAS, SSRS. I would recommend anybody for this training and as the tag line of your website says 'Quality Training Assured' and i thing it's apt for it. I am really delighted about the course and i am surprised to see the depth of your knowledge in all aspects of the SQL server. I see that many database architects with over 15+ yrs experience doesn't have the knowledge that you have. I really enjoyed your sessions, definitely look forward to learn more from you in the future. Thanks again Sai! for excellent MSBI tools training. Sai, I was your student when you started training initially.Now again i attended your DBA session. I am totally impressed by the training program. I have learned a lot of new topics from this program. Thank you so much. It was really good time to be part of this training program and I really enjoyed your teaching and practical classes. 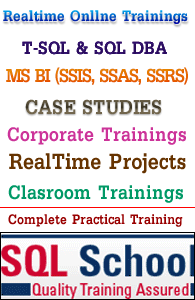 Thanks SAI PHANENDRA for giving EXCELLENT training sessions on SSIS, SSAS & SSRS. Basically I am from Manual Testing background. I joined your SQL server class and then now BI class(First SSIS and SSAS. After I took a break and then joined SSRS class) since I want to change my profile. Before attending your sessions, I did not know anything about the subject. But now I have confidence. I am very much thankful to you. Thank you very much sir. Learning is finding out what we already know. Doing is demonstrating that you know it. Teaching is reminding others that they know just as well as you\" & This is effectively done by you Sai and moreover the curriculum is so much necessary raw material which you processed in a better way that cleared all the doubts.ThankYou. Iam happy with your Training session.....your training is Good.....Thaksyou Sai . Hello sir, i am totally satisfied with your training classes. Thank You. The training was really very good. Apart from MSBI, I also learned some good concepts of Database too. Thank You ! Hi Sai, The T-SQL sessions were very good. These sessions were very much helpful to build and learn more about T-SQL. Thank you for providing and teaching T_SQL. I think this is the best online course I have taken so far..Well I am still in the process of learning new things but for me this learning process has become so easy only after I joined this course..as Sai is very organized and up to the point.. he knows what he is teaching and makes his point very clear by explaining numerous times. I would definitely recommend anyone who has any passion for SQL Server.. I am very much satisfied with online course. It is very interactive and easy to understand. I really enjoyed theses sessions. Thanks for your MSBI sessions. I want to thank you for your incredible efforts and sharing your vast knowledge. I am feeling lucky to have attended your great batch. You are awesome Sai, I am not sure when i will be able to attain 20% of your knowledge but i got a lot inspired by you. I will keep in touch and will always try to learn from you as much as I can. Thanks once again Sai.. This class is very detailed and informative and hands on. Mr Sai is well experienced and able to give real life examples. Unfortunately due to time constraints on my end I did not get to practice enough. I have a confident in SSIS after these session. I have little knowledge of SSIS prior to these session, I was not aware of Installation Check Sum and many more. Thanks a lot Sai. I have a very great experience with this course, I have learned large amount of information which I don\'t know before, most importantly I have learned very new topics about how to audit the package on error handling, break points, slowly changing dimension, SQL Mail and logins. Hi Sai, My name is Tejaswi. I have joined for T-SQL. The sessions are very practical and more informative. 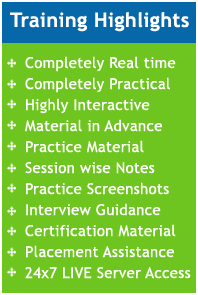 I\'m satisfied with the pace of the sessions and i am following the classes. Thank you Sai for the classes and giving me opportunity to leave the feedback. HE CLASSES YOU PROVIDE ARE VERY MUCH IN DETAIL AND VERY INFORMATIVE,YOU HAVE A VERY PLANNED DAY TO DAY SESSION BUT I THINK THE PACE OF THE CLASSES ARE LITTLE TOO FAST FOR ME AS I COME FROM A COMPLETELY NON - IT FIELD, BUT I GUESS IT WOULD BE FINE FOR OTHER ATTENDEES,ANYWAYZ I AM TRYING MY BEST FOR THE PRACTICE EVERYDAY.THANKING YOU FOR THE WONDERFUL CLASSES YOU PROVIDE. Sai you just rock. And i am proud to be one of your students. The way you handle things and explanation of subject is unique. And iam looking forward to learn more subject from you. Thank you. Sai got excellent teaching skills and provides great practical training which makes us easy and simple to understand. Im so thankfully sai phanindhra it was so valuable session ...excellent explaination by Sai. Thanks Sai for providing the MSBI training. I would really appreciate your way of training. You took time in explaining the basic (along with example and also make us to practice the same). The way of comparing 2008 & 2012 features was good and helpful. Somehow I found that starting the MSBI with IS - AS - RS was useful. I had a very tough time during the end of SSAS and start of SSRS due to project transfer. But understood my problem and help me by sharing the video. I would recommend your training to my friends. Actually one of my friend (your old student) referred you. I am sure you will have big reference chain. Best of luck for your future. It is 6 weeks of non stop training and I can't realize that we have completed our training. I feel that we should have had some more time. We will be missing you SAI.Thanks for the effort and patience you have showed all these days and I wish our relation should continue beyond this training. I once again thank you for everything. The training was great ! I have learnt a lot. Thank you very much! As someone who was completely new to OLAP and Analysis services, I found the course quite dense. One of the best practical training available on Sql Server. Each lesson is guaranteed to enlighten you or solve your daily production issue. Loved every moment of it. It was great learning experience with SQL School. MSBI training covered basic to advance level features of BI tools. I wish SQL School could also have Data Modeling and other courses that can help in learning end to end solution for bringing up Data Warehouse. Sai is awesome tutor!!! Thanks to SQL School. Hi Sai, Its a wonderful experience attending your training due to the following reasons. a. Your vast knowledge on the subject. Esp since you are only 6 year experienced. Now I could experience the mental calibre of IITians. b. Speed of answering questions c. Energy and enthusiasm. Its not easy to manage office and different batches at same time. d. Your parallel processing skills. Answering questions by typing and still continuing the talk and monitoring various things simultaneously. e. Packaging and planning of course topics capsulized and stopping almost exactly at 90 mins. Sai, You are a great teacher!!! I liked your approach to the concepts. You have a great knowledge and I see your quest to share the knowledge with us. You are an amazing trainer... You delivered everything you promised.... Thanks for the excellent training Sai. I will recommend your training to my friends. Very very practical training, excellent explanation and course structure. SQL school rocks! The course was very satisfying and Sai really helped me to understand the real-time situations and scenarios. Thank you Sai. I\'m very much satisfied with the training..I expected only the basic knowledge but I got more than that.but unfortunately I didn\'t get the chance to practice...I will start practicing from today itself.Thank You so much Sir..
hello sir.. I loved attending your classes. Thankyou very much for all the great information.. so informative and interesting..!! Thankyou..!! I am always fortunate to have had dedicated teachers in many walks of life, and i would certainly add Mr.Sai in that honorable group. His sincerity and commitment to drive the best to the students is very amazing. If every teacher thinks his way, the world would be a better place. And his command in the subject, SQL Server is simply superb. No wonder he is very strict. I like the training and hoping to learn more from Sai in future. Thank You Sai. My Wife and Me both really appreciate you and very glad we took this course from YOU. Thank You Very Much and we were very satisfied very much and we already got assigned working SSIS and SSRS tasks in my office. This is really Helpful... A good example for corporate training..and many concepts are out of books and website material..
Hi Sai, after joining the MSBI and DBA training, I have learned a lot and got a lot of command on the subject. Before your training, even though I have knowledge in SQL server, your training gave me lot of Knowledge and confidence and how to analyse the data, your case studys and tasks you have provided during the training really helped me to improve the knowledge and you have covered the topics that are not provided by other trainers . I am really very thankful for joining the training. Sailaja. Sai is an outstanding trainer. He helped me to understand all the concepts in details to very basic level. The level of command he has on the topics is really awesome. I\'m really satisfied with the kind of training provided by him and i wish him a very good success ahead. All the very best Sai. 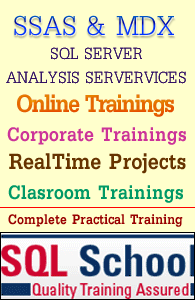 If you want to do MSBI course online training then SQL School is right choice for you. Thanks Mr. Sai for the excellent training and all your hard work and time that you put in each training session!! Great course! and nice materials/session notes and presentations provided. I enjoyed the complete training and I can take what I learned and start applying it directly to my practice and project once I am into it. This training provided great depth on the topics that were covered and clarified the questions when I got stuck. Your technical expertise in the area was reflected in all areas of the course and everything was done very professionally and cool. Its nice working with you and I will keep in touch for further questions and doubts on this course. 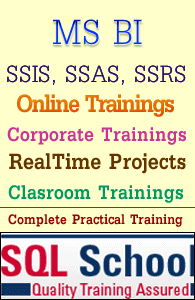 I was new to SSRS when I joined the SQL School and I see things are working very well as per the planned schedule by Sai and able to practise every day session after the class at home with the help of notes and screen shots. I want to thank you for the excellent training sessions. Even where I knew some of the material before hand your lectures provided much new depth and subtlety about the SQL Server and T-SQL. My task now is to take and pass 70-461 and then I will take another course from SQL School. Thanks again. It was great. Before attending I thought i would be skipping more than 4 to 5 sessions due to my work schedule which was told already. However the session ,its lecture notes and knowledge was so excellent that i have almost attended 99 % of sessions.Big thanks to Sai sir for conducting excellent sessions of SSIS and hoping other two modules (SSAS and SSRS) will be excellent. Good Evening ,Hope you are doing great . Your excellent teaching skills and courteous personality has helped me tremendously through my journey to lead as BI Developer in IT. After attending your training sessions , I finally got a wonderful opportunity with leading manufacturing company in Australia as a report Developer .This Training program has helped me a lot and also taught me more about BI . This was probably the most useful training I have done which can impact my career first hand. Plenty to think about, lots to put into practice,well planned and resourced course. I enjoyed all of the sessions and session by session confidence levels were improving for which I have to thank you for. I believe that all the concepts taught in workshops lay a good foundation thus ensuring basics are strong, credit goes to you for putting this complex technology in a simpler way. However I need to look back, revise, practice a lot and get a grip on it, so I'll be troubling you with questions as and when, kindly bear with me. My only concern being, terminology attached to course curriculum looks like its a lot, you must have covered all of it, the big challenge here would be to sell myself in the market, as I'm completely from Non-IT background ( currently working in Hospitality Sector in a Managerial Role in London), so I'll need some guidance and support accordingly to crack a job. This course has been very informative and very easy to understand. I have not been able to find such a course anywhere. This is very practical.